This passage from Isaiah 11:1-5 is one of several significant passages concerning the Holy Spirit in Isaiah. There shall come forth a Rod from the stem of Jesse, and a Branch shall grow out of his roots. The Spirit of the Lord shall rest upon Him, the Spirit of wisdom and understanding, the Spirit of counsel and might, the Spirit of knowledge and of the fear of the Lord (Isa. 11:1-2, NKJV). Behold! My Servant whom I uphold, My Elect One in whom My soul delights! 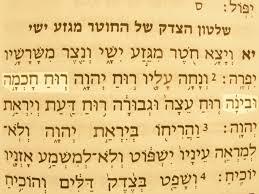 I have put My Spirit upon Him; He will bring forth justice to the Gentiles (Isa. 42:1). The Spirit of the Lord God is upon Me, because the Lord has anointed Me to preach good tidings to the poor, etc. (Isa. 61:1-3, NKJV). Available at Amazon USA / UK. 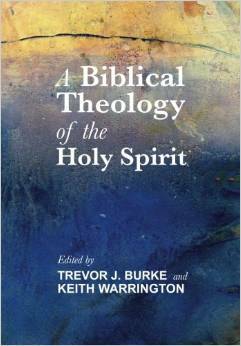 In this post I am looking at chapter 4 which explores the Holy Spirit in Isaiah. This post continues a series based on the book A Biblical Theology of the Holy Spirit. In our last post I looked at “The Holy Spirit in the Historical Books” (click here to read this post). You may be wondering what happened to looking at the Holy Spirit in the Books of Wisdom. There is actually very little said about the Spirit in the Wisdom Books and my reading of that chapter (chapter 3 in the book), although interesting, did not, in my opinion, reveal any significant information that would contribute to our search for a better understanding of the Holy Spirit. Unfortunately, the same is true of chapter 5 which deals with the Holy Spirit in Jeremiah. As it turns out, Jeremiah never specifically references the Spirit of God. Therefore my next post will also omit looking at the Holy Spirit in Jeremiah. The good news is that the subject of the Holy Spirit in Isaiah, our current topic, proves to be a rich study. Wonsuk Ma (the author of this chapter) divides the treatment of the Holy Spirit in Isaiah into two main (Old Testament) traditions: “charismatic and non-charismatic Spirit traditions–of which there are two examples of each in Isaiah. The two charismatic Spirit traditions relate to leadership and prophetic Spirit traditions” (p. 35). We have noticed these traditions in my previous posts on “The Holy Spirit in the Pentateuch,” (click here) and “The Holy Spirit in the Historical Books” (see above link). 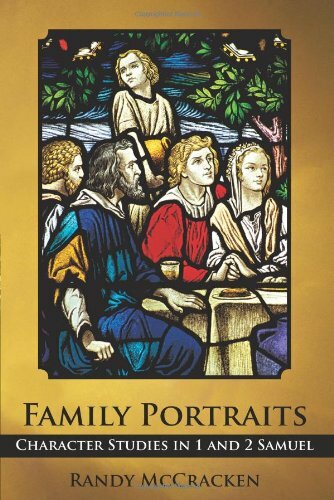 “The two non-charismatic Spirit traditions in Isaiah are related to the creation and wisdom Spirit traditions” (p. 35). Isaiah pictures the coming Davidic King as Spirit-empowered yet serving in weakness. 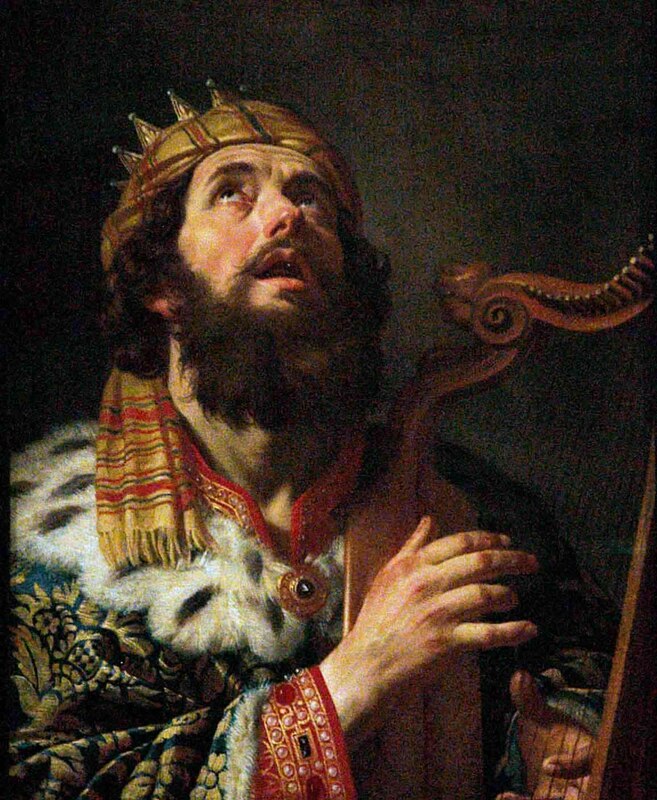 Painting by Gerrit van Honthorst (1590-1656), ‘King David Playing the Harp’ (1611). In the Book of Judges, we noticed how the Spirit confirmed God’s choice of a leader and also empowered that individual (Gideon, Samson, etc.) to accomplish acts of deliverance on behalf of God’s people. This always involved military intervention or, in the case of Samson, his physical intervention and defeat of the enemy. Two passages in Isaiah show continuity as well as discontinuity with this tradition. For example, the future Davidic king spoken of in Isaiah 11:1-5 is still designated as leader by virtue of the Spirit being upon him (continuity), but in place of an expression of military might, Isaiah identifies him as one who will render justice for and protect the weak (discontinuity, Isa. 11:4). Although there is language about slaying the wicked, the instrument spoken of is not a sword or spear but “the rod of His mouth,” and “the breath of his lips.” Ma states, “The king was expected to admister justice and righteousness by protecting the powerless in society and judging the wicked, resulting in not only the flourishing of God’s people, but also the restoration of God’s entire Creation into harmony and order (Isa. 11:6-9). This is a radically different picture from that recorded in the books of Judges and 1 and 2 Kings” (p. 37–emphasis mine). In Isaiah 42:1-4, Ma points out that while this passage once again connects leadership with the Spirit, the authority of the leader in this case is one which “is more related to ‘depowering’ than ’empowering’….There is a very strange reference to weakness, suggesting that empowerment is to minister in weakness to the weak (Isa. 42:2, 4)” (p. 38). Ma notes that while these passages continue older themes about the Spirit, they also introduce new features. Ma notes 3 major functions of the Spirit within this tradition (all of which we have seen in the previous posts): 1. The Spirit is the causal agent in prophetic behavior; 2) the Spirit is the source of the prophetic word; and 3) the Spirit is the source of prophetic empowerment (pp. 38-39). Ma begins by looking at the famous passage in Isaiah 61:1-3 and he notes two contrasts with the above prophetic Spirit tradition found in this passage. “First, there is no hint of the ‘prophetic frenzy’ that characterized the Spirit’s presence. Second, while the passage itself is a received message (or an oracle), the Spirit’s presence is more linked with the task at hand than as the source of this message” (pp. 39-40). One link with the previous pictures of the Holy Spirit in Isaiah is that the anointed one spoken of here brings God’s liberating power to the poor and suffering. 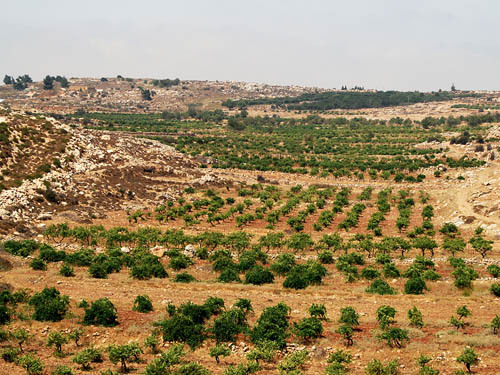 The Holy Spirit in Isaiah is said to bring fertility to the land. The last two traditions regarding the Holy Spirit in Isaiah are connected with what Ma refers to as the non-charismatic tradition. Regarding the significance of the Creation theme in Isaiah Ma writes, “The vision of God’s complete rule is a major concern of Isaianic traditions. The rule of God or lordship is universal in scope as it goes beyond Israel, God’s people, and encompasses all of Creation” (p. 41). This outlook is also eschatalogical. Ma selects two texts to illustrate this focus. Isaiah 32:15-18 speaks of the pouring out of the Spirit and the fertility that is brought to the land, along with a restoration of righteousness and justice. In Isaiah 44:3-5 the pouring out of the Spirit brings fertility to the people and to the land. Ma notes that “The imagery of water is repeatedly used to describe the coming of the Spirit in abundance here, as also in Isaiah 32” (p. 42). The connection of the Spirit with wisdom is already evident in the Joseph story when he appears before Pharaoh (Gen. 41:37-39). Isaiah 30:1-2 demonstrates the disconnect between God’s Spirit and a hard-hearted nation that seeks counsel from the world (Egypt). Although there is no direct use of the word ruach, Ma also connects Isaiah 40:13-14 with the wisdom Spirit tradition, a passage which speaks of the Lord’s wisdom in Creation. Just as we noted a progression in the understanding and work of the Spirit when moving from the Pentateuch to the Historical Books, similarly we can see how Isaiah utilizes the same traditions but also pushes them to new horizons. The connection of the Spirit with a Davidic leader who will rule in power, yet also through weakness, clearly anticipates the ministry of Jesus. The renewal that the Spirit brings to all of Creation in the time to come paves the way for the same recurring theme in the New Testament. The description of the function and work of the Holy Spirit in Isaiah is certainly an important development in the Scripture’s declaration of the nature of the third person of the Trinity. Ma does an excellent job in illuminating continuity with past traditions of the Spirit, while demonstrating the new features developed in Isaiah. Yes Lindsay. Ezekiel will be the next installment in this series. Hi Randy, I was looking up references to the Holy Spirit in the book of Isaiah for my 5 yr old grandson, Isaiah. He accepted Christ this month but for at least a year talks about the Holy Spirit frequently. I found this article and liked the content but was looking for the credibility of the writer & there was your name & picture! With assurance I am forwarding it to Angel & her husband. Thank you for your marvelous work! Love & blessings to you & Gloria! Good to hear from you! I’m glad you found the website helpful. Congratulations on your grandson accepting the Lord so early in his life. I pray that God will bless him. I will relay your love to Gloria. God bless and love to you and Brian!